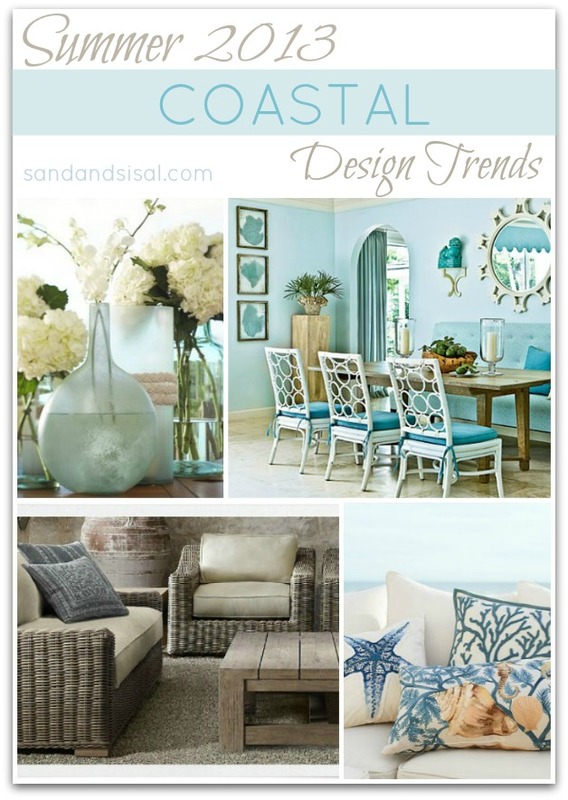 Summer is right around the corner and I want to give you the Sand & Sisal Summer Coastal Design Trends 2013 forecast. This summer it’s all about Glass ~ Water ~ Wood. 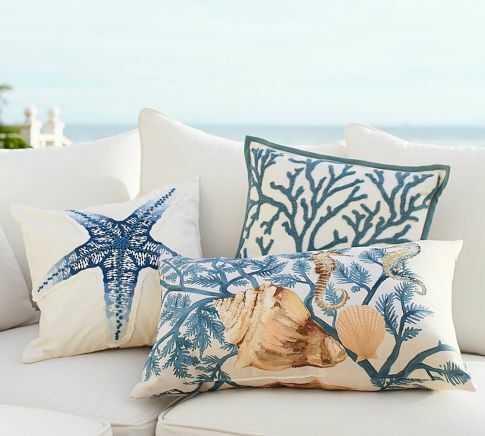 The first summer coastal design trend Sea Glass! Who can resist the soft, frosty and translucent sea colored hues of sea glass? 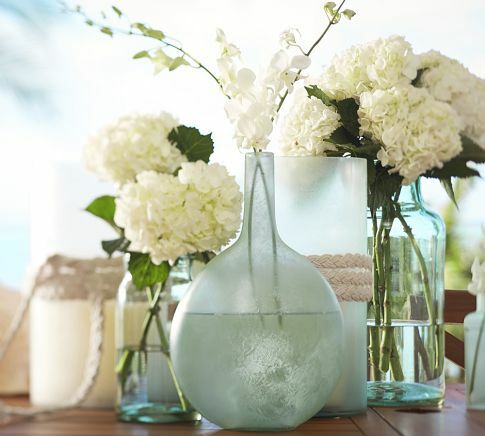 Use several sea glass vases, or glass hurricanes filled with sea glass and candles, or even a sea glass tray for your summer table top decor. The second summer trend is anything WATERCOLOR. Water color is a hot, hot, hot trend for 2013! Just look at all of these products on the market today focusing on Watercolor home decor. The easiest way to add a touch of water color is with watercolor painted pillows. Weathered wood will continue to be a popular trend through summer 2013. Look for natural or all-weather wicker in a beachy- drift wood colored finish. Also rustic, no-frill, industrial style wood tables and side tables are a focus. It’s all about getting back to simple and natural basics. 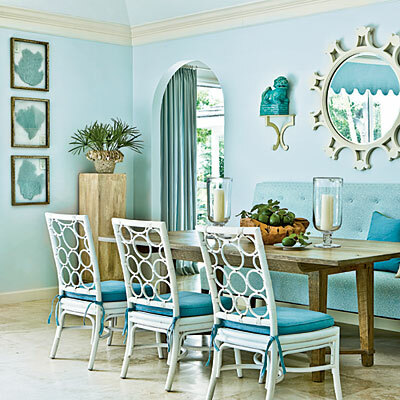 The 2013 Summer Coast Trend Color is SEA GLASS. Sea glass color ranges from dusty blues to frosted emerald. Pair the soft sea glass color pallet with bold accent colors like cobalt. Notice the mix of natural wood and cane furniture in this room…. beautiful! Would you like a chance to chat with some of the blogosphere’s top designers?! Bloggers who have their finger on the pulse of the latest summer designs, decor and DIY trends? If so be sure to join us this Thursday, May 2nd from 9-10 PM EST, where I’ll be participating the Hometalk Summer Home Decor Trends Twitter Chat with an amazing panel! Heather of At the Picket Fence, Michael Wurm, Jr. of Inspired by Charm, Darlene Weir of Fieldstone Hill Design, and Jeanna of SAS Interiors and I will be there to help answer your design and decor questions as well as share their top picks in Summer Design! To be entered to win one of FOUR Fabulous Gift Cards be sure to RSVP for the party! Use Tweetchat for easy chatting. Anyone can participate, but you must be following @Hometalk and … and RSVP before the chat! P.S. Winners will be selected at random from RSVP’s. (If a winner is chosen who RSVP’d but did not attend a 2nd winner will be chosen.) Leave us a comment if you have any questions. 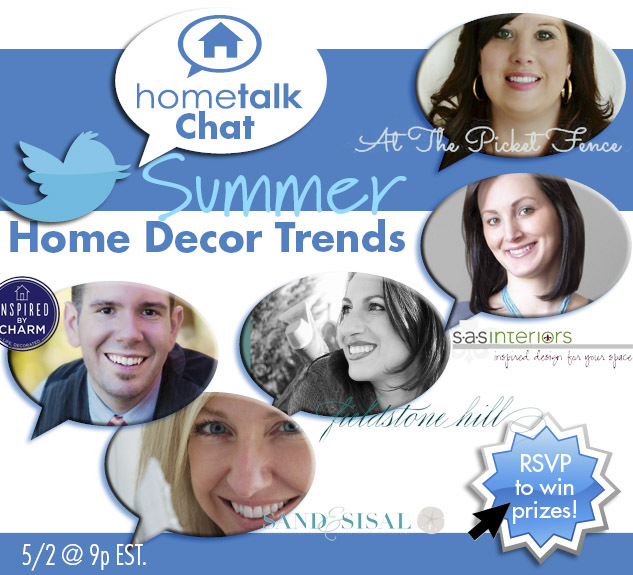 Anyone can participate, but you must be following @Hometalk and … and RSVP before the chat! Love these coastal ideas!! All so beautiful. Can’t wait for the party tonight! See you then.